Raymond Clifford Cook was born August 20, 1936 in Dallas, Texas. The six foot, right hand hitting Cook was signed by the Cincinnati Reds in 1955, scouted as a third baseman with power. In the minor leagues he had three seasons of 30 plus HRs & 100 plus RBIs. He was brought up for a cup of coffee by the Reds in September 1959 going 8-21, good enough for a .381 average. In 1960 he hit his first career HR but struggled batting just .208 after 54 games when he was sent back to AAA. In 1961 he was the American Association MVP belting 32 HRs with 119 RBIs while batting .311. He was called back up in September for four games with the ’61 NL Champion Reds. In May of 1962 he was traded along with Bob Miller to the expansion New York Mets for Don Zimmer. He got his first start at third base on May 9th 1962, in Chicago, going 1-4 in the Mets 3-2 win. In his first home start at the Polo Grounds, he got two hits, including a triple and an RBI against Bob Shaw & the Milwaukee Braves. He would have six multiple hit games in his first month, but was barley hitting .200. On June 9th he hit a HR at Wrigley Field & then drove in two runs two games later in the Mets , Cubs series finale. 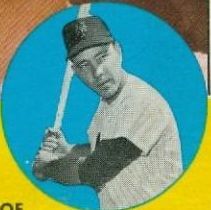 Cook played in 46 Mets games,seeing the majority of his playing time at third base. Cook made five errors in 41 chances at third (.878%) and was moved to the outfield for ten games. It was another third base experiment for the early Mets that failed, a dilemma that would go on for years. Cook suffered from chronic back problems that kept sidelining him from steady action, and by mid July his season was over. On the year he had 117 at bats with two HRs six doubles & nine RBIs hitting for a .232 average. 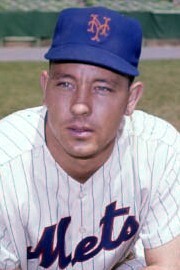 In 1963 Cook returned to the Mets, as a utility player. On May 5th 1963, in the second game of a double header, Cook hit a two run HR against Billy Pierce & the San Francisco Giants at the Polo Grounds helping New York split the twin bill, 4-2. 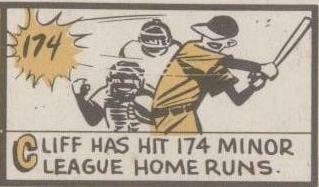 He would hit his fourth & final Mets HR later that month in San Francisco against the Giants as well. On June 9th he drove in runs in both ends of a double header, in the second game as a pinch hitter. In July he was hitting just .142 when he was sent back down to AAA Buffalo to finish out the year. Cook played in 50 games with the ’63 Mets, with two HRs a pair of doubles & eight RBIs. In 1964 at AAA Buffalo he hit only .224 & retired from baseball after the season. After a five year career he batted .201 with 80 hits 7 HRs 17 doubles 35 RBIs & .254 on base %. He posted a .937 fielding percentage at third base making 14 errors in 86 career games. He also played 35 games in the outfield & five games at first base..
Retirement: After baseball he ran a sporting goods shop in Fort Worth, Texas. Had the pleasure of meeting Cliff today, definition of a gentleman..